The 12 year old metal roof system continued to leak and allow water into the electrical panels beneath which caused extensive damage. Fasteners on the roof were loose and pulled away from the panels resulting in failed seams causing the leaks. The owner did not want to tear-off the metal panels and open the building up to the elements. Additionally, there was an ongoing challenge of cooling the area beneath the roof because there was no insulation installed when the roof was originally put on. 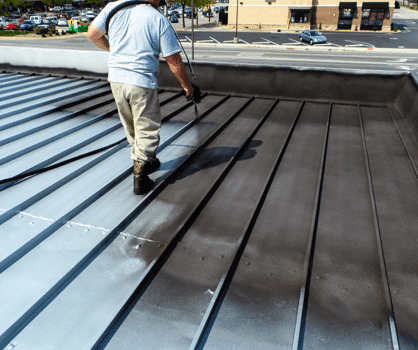 To avoid tearing-off the metal panels, the consultant recommended a recovery of the existing roof system with 80 mils of TRITOflex liquid rubber waterproofing membrane system. TRITOflex is a water-based, environmentally safe coating system with no VOC’s. Also recommended was a ceramic white top coating to be applied over the TRITOflex liquid rubber waterproofing membrane to create an insulating thermal barrier to the sun and help prevent heat absorption into the building. This recommendation addressed the building’s cooling deficiencies and facilitated an aesthetically pleasing monolithic waterproofing barrier over the existing metal roof panels. The new roof recovery system was installed within 2 days without disturbing the occupants and withstood a major storm event the day after it was completed with no leaks. If you are looking for the last roof you'll ever need! Learn more about our 40 year warranty on labor and materials! ASK AN EXPERT and GET A FREE QUOTE TODAY! 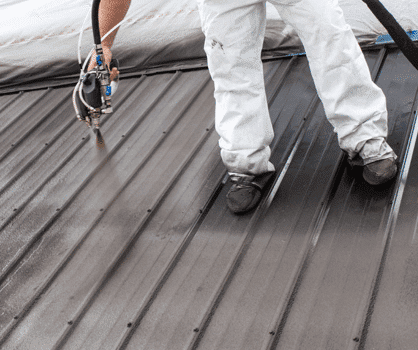 © 2008 – 2019 Austin Roofing & Waterproofing. All rights reserved.